Today I decided to get down to business. I cleaned. I finished my quilt top. I put the laundry away. I saw my bag of “off to goodwill” clothes and rummaged through it. 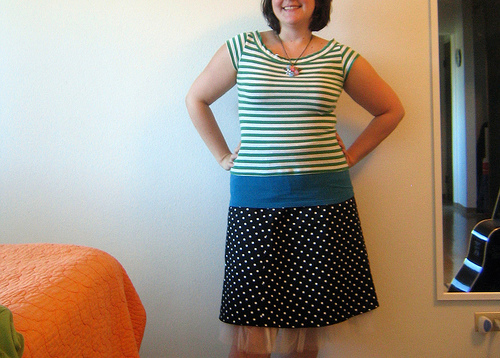 I have 4 or 5 tops– the same exact top, but different colors and stripes– that are just too short from all that laundry shrinking. I’ve worn them to death and yet I was sad to put them in the bag. So I thought, what the heck, I’ll make myself a hand-me-up shirt a la Betz White. I added a section of one to the bottom of another. I repeated with a second two shirts (above). It was much easier the second time. I don’t always take the time to do something twice, but lately I have been, and it’s working out for me. All I did was turn the main shirt inside out, match the raw/cut edge of the wrong side to the main shirt wrong-side hem, sew, flip inside out, and resew the right side bottom hem of the main shirt (encasing the raw edge). Super easy. And now I don’t have to buy new shirts, nor worry about my unintentional midriff shirts. Seriously, what’s wrong with clothing manufacturers? 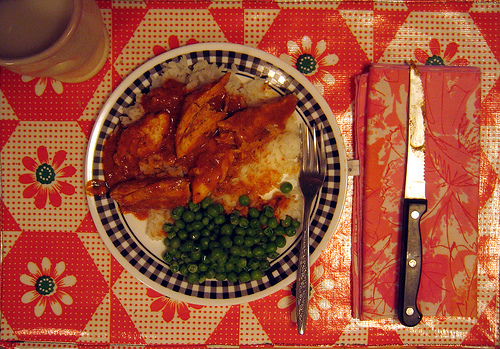 After that, I made some chicken tikka masala. Did you know there are no Indian food restaurants in Bozeman? And no Thai places. And just so-so Mexican food. So when I saw Nancy’s post, I was inpsired. But even more inspiring was finding the already made sauce in the ethnic aisle of the grocery store. It was pretty good for not having been made from scratch. Thank goodness for shortcuts. Friday I will be posting my patchwork swap makings (I just can’t wait any more!) and also giving away a second batch of scraps, and possibly something else. Stay tuned! I don't know if you will even get this now (almost a year later), but if you are looking for basic tees that are on the longer side, you have to check out www.downeastbasics.com. They are very limited in locations right now but I am fortunate enough to have one nearby me. Darling skirts and check out their "wonder tee"! All of their shirts are cut on the long side but if you are looking for even more length, go with their maternity "wonder tee" - it's not bulkier through the midsection, but it is a couple of inches longer. I've also found that they don't shrink in the wash. Love them! BOZEMAN! That is where my husband's from.....his Dad still lives there! I just love that town. Walking downtown during a fat snowflake fall and popping in and out of the shops...aaahhh! Thoroughly enjoy your blog! Thanks for sharing so many creative ideas! What a grand day and whatta grand blog. That IS a really great idea! Your top looks great. I like my shirts on the longer side and just hate it when they shrink short! hey, that's GREAT! what a wonderful idea. i don't get why clothes do that? it's ridiciouls! and good thing that you did do it, b/c the green shirt certainly would have been too short!